CPDR is a comprehensive research program to study prostate cancer and prostate disease, CPDR was established in 1992 (Public Law 102-172). The program’s mission is fulfilled primarily through its three principal programs: (1) the Clinical Translational Research Center; (2) the Basic Science Research Program, and (3) the Tri-Service Multicenter Prostate Cancer Database to encompass its clinical research work with participating military medical centers. A prostate cancer clinical trials center at Walter Reed National Military Medical Center (WRNMMC). Recognizing that too few men have participated in clinical trials in the past, this Center will make state-of-the-art research trials available to deserving military health beneficiaries. The Center is open to all beneficiaries worldwide. The only free-standing prostate cancer research center in the U.S. This 20,000 square foot state-of-the-art basic science laboratory facility is attracting the best and brightest to study the disease. Using blood and tissues collected from volunteering military beneficiaries, the CPDR laboratory has amassed a large bank of prostate cancer specimens that are serving to unravel the genetics of the disease. The largest, most comprehensive prostate cancer database in the United States. Involving the Army, Air Force, and Navy at multiple military medical centers, the program is a model for interservice cooperation and research collaboration. With approximately 26,000 prostate cancer survivors enrolled to date, the CPDR database is rapidly becoming a national resource. The content provided on this web site is for informational purposes only. The information on this web site is not intended to replace medical advice. You should review the information carefully with your physician(s) before adopting any of this information into your current medical plan. CPDR provides clinical and research information that is complete and in accord with the standards in existence at the time of publication. However, CPDR does not warrant that the information contained herein is in every respect accurate or complete and CPDR is not responsible for any errors or omissions or for the results obtained from the use of this information. CPDR makes no representations or warranties with resect to any treatment, action, process or application of medication by any person following the information provided by CPDR. CPDR will not be liable for any damages arising from the use of this information. The opinions and assertions contained herein are the private views of the author and are not to be construed as reflecting the views of the US Department or Defense. Please consult with your doctor before adopting any of the information found on this site into your current healthcare plan. 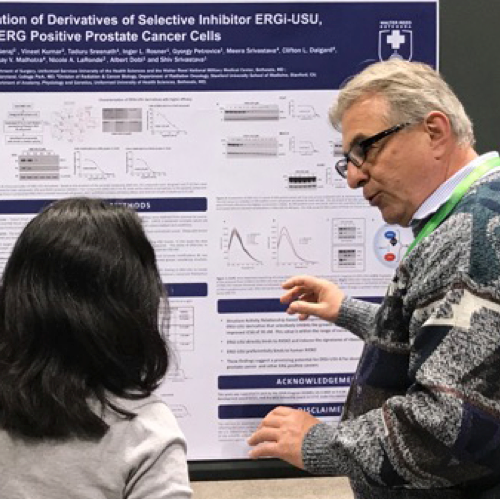 The 2018 AACR Annual Meeting gathered this year at McCormick Place, Chicago, Illinois from April 14 to 18 under the theme of Driving Innovative Cancer Science to Patient Care. The Center for Prostate Disease Research (CPDR) multi-disciplinary team - together with collaborators – delivered one podium presentation and 12 poster presentations. The team was co-led by Dr. Shiv Srivastava, CPDR Co-Director and Professor, and Dr. Albert Dobi, Associate Director, CPDR and Research Assistant Professor, of the Department of Surgery, USU and WRNMMC. Mol Cancer Res. 2017 Oct;15(10):1308-1317. doi: 10.1158/1541-7786.MCR-17-0058. Epub 2017 Jun 12.
and the Henry M. Jackson Foundation for the Advancement of Military Medicine.